The CEO lamented the company's recent app redesign, which drew outcry from users and contributed to the company's decline in daily active users. 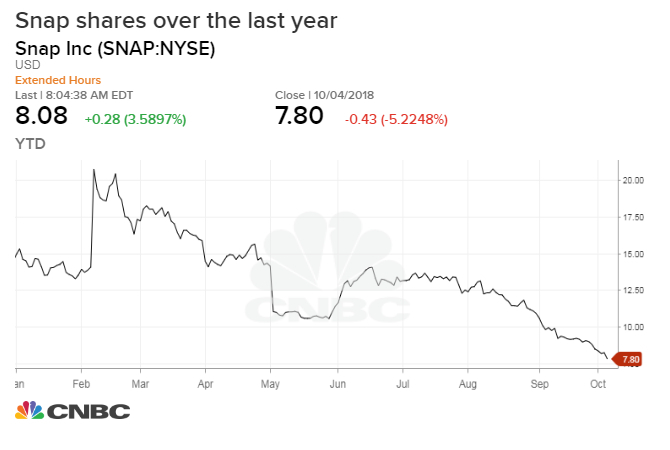 Snap stock sank to all-time lows Thursday after an analyst said competition from Instagram is "irreversibly reducing Snap's opportunity to deliver on long-term investor expectations." Snapchat co-founders Bobby Murphy (l) and Evan Spiegel (c) ring the opening bell on March 2, 2017, as NYSE President Thomas Farley looks on. Snap shares slipped on Friday even after it was revealed that chief executive Evan Spiegel said in a memorandum to employees that he wants the company to turn profitable in 2019 and issued a slew of new strategic goals. The struggling stock fell 0.7 percent Friday, adding to a year-to-date loss of about 47 percent. The CEO also lamented the company's recent app redesign, which drew outcry from users and contributed to the company's first decline in daily active users in the last quarter. "In our excitement to innovate and bring many new products into the world, we have lost the core of what made Snapchat the fastest way to communicate," Spiegel wrote in last week's memo. He also said the update was "rushed," and he detailed other problems with the app. When reached, a Snap spokesperson declined to comment. The website Cheddar first reported on the memo. Snap is trying out new designs for its Discover section, which showcases professional companies and celebrity accounts. He also explained challenges the app faces from competitors and from growth. The stock sank 5.2 percent Thursday after Evercore ISI said growing competition from Facebook's Instagram is "irreversibly reducing Snap's opportunity to deliver on long-term investor expectations." The stock hit a new all-time low following the Evercore note and fell to as low as $7.56 per share shortly before 1 p.m. ET Thursday.